All must have seen ads which ask us to pay the income tax and other taxes correctly so that the money is spent of infrastructure. See this case where the ax payers money is spent and money goes into the drains. This particular case is of the Traffic Signals installed near Globe Circle (Cantonment Office), one Traffic signal lies in the drain on the sides,which was thrown there during the road widening in March 2011 for the VKS. 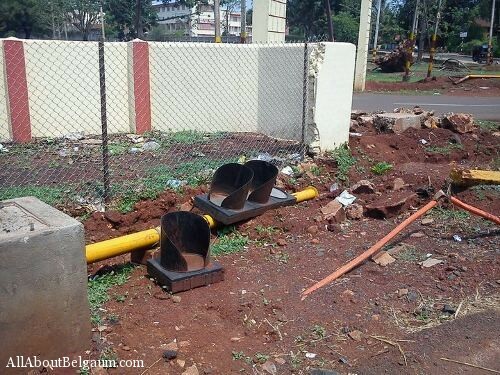 The story of this Traffic Signal is also devouring. These traffic Signals in questions were installed here somewhere around 2008 and they were never officially inaugurated, hence they never functioned since 2008. Now after the road widening who is going to look at them. One lies near the Globe compound, another lies opposite side near Cantonment office. Who cares? In India people are fighting against corruption, but also need to fight against this menace of spending the tax payers money for no use. We still cant imagine how no one has ever seen this since March 2011, if one cannot make the signals work atleast it should be seen that the Signals are picked and thrown in such a place which is not accessible to the general public at large. We all need to fight corruption and also this. Call the SP’s office and tell him about this. Ya rite like the SP is gonna give a Rat's A** to anything like that. He's got truck loads to make jus like others…he did not come free…he paid for his job now he's got t reap it…..
On the other hand this has been a way of life in India…anywhere u go…its the same type of issue…hopefully we will light at the end of the tunnel…for now I dont see light for a few generations to come. Its all comes from the upbringing.